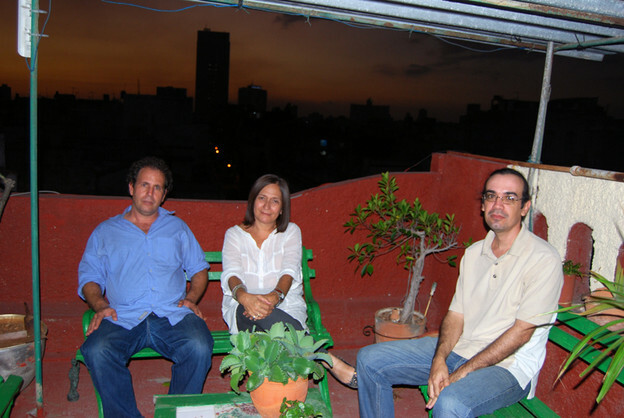 Ricardo Alberto Pérez, Reina María Rodríguez, and Ramón Hondal out on the terrace as the sun sets over Havana. It is a Tuesday evening in January at the azotea, the home of Reina María Rodríguez, where so far two writers have stopped in for a coffee and conversation. Others might or might not come tonight; there’s another gathering in a couple of days. Reina lives a short walk away from the Capitol building in Havana, in an apartment building a few blocks from the ocean. The apartment itself comes with a literary history. Reina used to host much larger gatherings here, particularly during Cuba’s “Special Period” of economic crisis in the 1990s, when artists and writers met regularly. Nowadays she remarks that the work of hosting all those salons in her home is too much to undertake.Still, she continues to work as a literary organizer, and the azotea is still a place where smaller events happen from time to time, and where university and cultural tour groups listen to readings by local writers. Formal or informal, an evening at the azotea generally includes established writers as well as others who are just emerging. It’s also common to find a mix of people who still live in Cuba and those who are partially or completely based abroad — a regular thing in the everyday life of the capital city in the post-Soviet era. The intensity of emigration and the growing acknowledgment of diasporic Cuban life do not erase all of the tensions around this subject in Havana, but many individual Cubans and institutions are increasingly comfortable referring to the phenomenon. At my side today is Richard: Ricardo Alberto Pérez, whom I have met at the azotea in the past. He continues to live and work on the island. Ricardo Alberto Pérez with Reina María Rodríguez in the living room at the azotea. Photographs by Kristin Dykstra, 10 January 2013. While Richard has published work in other countries, relatively little has appeared in the United States or in English, despite the fact that people here refer to him using the English version of his first name. I ask him to answer some questions for me. Where were you born? In Havana. What part of Havana? Arroyo de Naranjo, which is to the southeastern side of the city (but we have to consult two other people to confirm this point: Richard explains that geography is not his strong suit). When did you begin to write poetry? 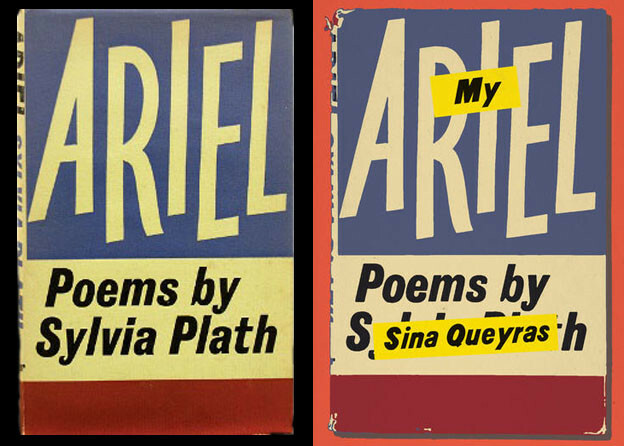 At age sixteen, and those early poems were very bad. Reina refuses to make any more coffee now, having made croquetas and the first round of coffee, so Richard disappears into the kitchen for a short time. The conversation continues nonetheless, including some dark humor about whether or not it will make one a famous poet in the US if I write here that said poet’s immediate family includes several suicides, including his mother, who made eighteen attempts before the one that took her life in the Special Period. This is, in fact, all true of Richard’s life. It leads to some remarks about Angel Escobar, the poet whose suicide from the late ’90s is still a regular point of reference here. Many of the poets from the greater Havana area had known Escobar well for years. Nearly all are careful not to overstate their friendships with him, perhaps in part because his worsening illness eventually affected his personality and ability to exchange his writing with them. Like many established Havana writers, Richard has spent time outside the island, which not only gave him a broader perspective on literatures and cultures but also led to publishing projects like the anthology La Habana Medieval, his edited collection of contemporary Cuban poetry released by a Brazilian university press and available in some US libraries. Among his other books are Geanot (1993, poetry), Nietzsche dibuja a Cosima Wagner (1995, poetry), Turin sin pájaros sin reloj (1999, Brazil, bilingual edition of poetry), Trillos urbanos (which refers to a song by Caetano Veloso; 2003, poetry), Vibraciones del buey (2004, poetry), Catorce poetas brasileños (2006, translations of Brazilian poetry), Perhappenis (2007, anthology and translations featuring the work of Paulo Leminsky), Oral B (2007, which won the Nicolás Guillén prize for poetry), and Para qué el cine? (2010, a collaborative work with artist Ezequiel Suárez). Richard has another book in press as I write: Vengan a ver las palomas de Varsovia, a poetry collection. In addition to composing his own writing, Richard does a radio program dedicated to international poetry. And recently, he began to publish essays about Cuban artists, pieces that are more accessible to readers of English than most of his other writing to date. The art essays are being translated into English and appear online at the British site Cuba Absolutely. When I finish adding italics to all the book titles in my list, I look up and find that everyone has disappeared. I find them clustered by the bathroom. Richard is attempting to fix the sink. No one has been able to stop this week’s especially pernicious leak, Reina says. Watching nearby is Ramón Hondal, who has recently finished writing his third book of poetry and is next in line to fix the bathroom sink. He adjusts a large plumber’s wrench. Ramón’s books are not yet published, but Reina is encouraging him to move forward with them and thinks the latest one is especially good. Meanwhile, he has been amassing a collection of audio recordings of poets, including material by Escobar. I go back into the kitchen to see how the sink is coming along and find Richard with a broom: “This is going really well,” he says to me, and I realize that the sink problem has escalated and the entire floor is covered in water, which he’s sweeping out onto the roof. “We’re going to be cleaning all night!” Reina says. It will take a while for the floor to dry, so everyone goes outside as the sun sets. Richard and Ramón spar about who has done more damage to the sink. This episode might seem to be irrelevant — another digression derailing my dispatch — and yet there’s a material impact for local poetry. It is the sort of occurrence that causes Reina to reflect on why she has not returned to hosting more large-scale readings out of her home. Problem sink at the azotea. Life intrudes again on literature: another poet, Carlos, calls to say that his car has broken down. After literally pushing it down the street, he will have to spend the evening running around in search of parts, so he can’t make it today. Richard’s poetry has changed in recent years. Earlier books, the ones up to Oral B, are collections of poems he conceived one at a time, individually, then organized into groups afterwards. His most recent manuscripts are evolving differently. The concept comes first, and individual texts are subsidiary to it; some have no title. These newest manuscripts can even be seen as partner projects. The content of one book engages moments of strangeness within national culture. He comments that his most recent works are most influenced by North American writing, emphasizing shorter poem lengths and a certain quality of agility he associates with English-language writing. Two of his manuscripts in progress are currently entitled Miedo a las ranas and Piñera en el balancin (he points to a rocking chair to illustrate what “Balancin” means, and emphasizes the reference to Virgilio Piñera). We look at the title poem of the book that is just about to come out, and I write up a translation. Come! and see the pigeons of Warsaw. Their biological activity the counter-attack. a piece the virtuoso refuses to play. pigeons will become a musical staff attracting attention. Vengan a ver las palomas de Varsovia. Su actividad biológica a contragolpe. una obra que se niega a tocar el virtuoso. las palomas serán un pentagrama atendible. Why Warsaw? I ask Richard, taking advantage of this opportunity to ask the little questions. He smiles: he’s fascinated with post-Soviet nations, with the complexities of their relationships to the past and the present. In this respect, Eastern Europe exists in a sort of parallel space to Cuba. Why Arezzo? Personal touch. It’s where a former girlfriend lives. When I come back to this commentary two days later, before a reading at the azotea for a literary tour group, I remember that I once translated a handful of poems from one of Richard’s earlier books, Vibraciones del buey, but never published them. and stared suspiciously at the swine. placed the swine in the most seductive location. and directed ironic gazes toward the Catalans. leaving an expression on the Catalans: dumbfounded, as if suspended. y miraron con malos ojos a los cerdos. puso en el lugar más seductor a los cerdos. dedicándose a mirar con ironía a los catalanes. dejando pasmada, como en vilo, la expresión de los catalanes. for applauding at the circus. to which I climbed every day. until the politicians’ speeches grew less consistent. para aplaudir en el circo. hasta el discurso de los políticos parecía menos consistente. al fin de la cosecha.